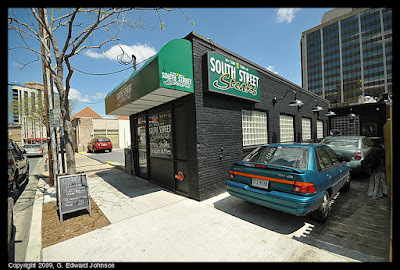 South Street Steaks just opened at 4856 Cordell Ave, Bethesda, MD. They primarily serve Philly Cheesesteaks but also have chicken cheesesteaks, Hoagies (subs), and Phillinis (a phillyized version of the panini). I went there and got their Cheesesteak, the most authentic one. it has meat, cheese, fried onions and bread. For cheese, I choose to keep it authentic and get cheese-whiz on it. I also got a side of fries. The cheese steak was was very good. I decided I prefer other kinds of cheese to cheese-whiz, but they offer several different kinds of cheese so I can't hold that against them. I do wish they had put the cheese-whiz on after the steak so it spread more. The steak itself was very good, thinly sliced and not over-chopped. The fried onions were excellent and really added to it without stealing the limelight. The fries were excellent, they had a crunchy-crispy outside (I think there was some kind of starch based substance added) with a little bit of pepper. I usually eat fries with Ketchup (or vinegar) but these didn't need that, in fact, they were better without it. Also of note, they have Diet Dr. Pepper in the soda fountain, you don't see that very often but I like it. The restaurant is very narrow, and it took me a few seconds to figure out where to order (in fact, someone who came in after me had to ask) But it is inviting, the walls are covered with huge pictures from Philadelphia, including one from South Street. Overall, very good, too full of fat for eating everyday, but worth the load of calories occasionally. 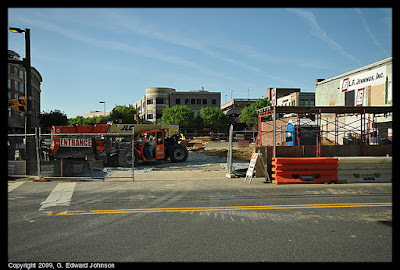 If you have been on the Capital Crescent Trail in Bethesda, MD you have probably noticed the rest area near the car dealership and Bethesda Ave, it had benches and a water fountain (including one for dogs). 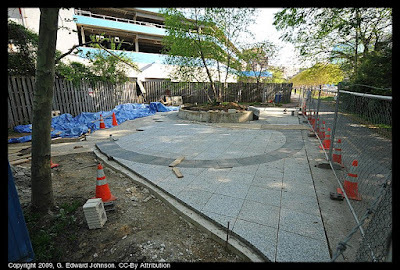 They are currently re-doing the whole area with granite pavers and a new seating area. The water fountain and maps will be back when they are done. 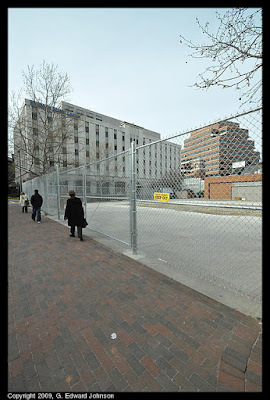 The area is currently surrounded by a chain link fence and the granite pavement is probably 80% done. It looks nice. Construction should be completed by May 15th. More at the Capital Crescent Trail website. Update May 18: It still isn't finished. This afternoon they were still putting in some pavers where I think the water fountain will go. Signs aren't up and the water fountain isn't back in. The parts that are finished look really nice though. 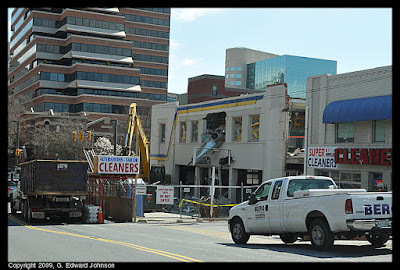 The demolition/construction on Woodmont Avenue between Hampden Lane and Elm Street is really moving along. At the beginning of the month they were just starting to tear the old building down, by the middle of the month it was pretty much bare dirt. 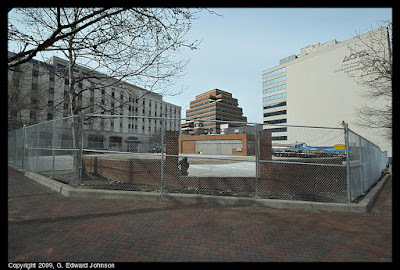 Now, the old building is completely demolished, the ground is cleared, and they are starting the new building. They had some big piles of wood there and it looks like they were building concrete forms out of them. 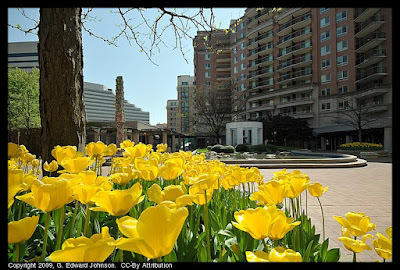 I didn't realize how many tulips there are in downtown Bethesda, MD. There in every planter on all the street corners. Most of the flowers are yellow or red. The weather is supposed to be beautiful this weekend so get outside if you can. 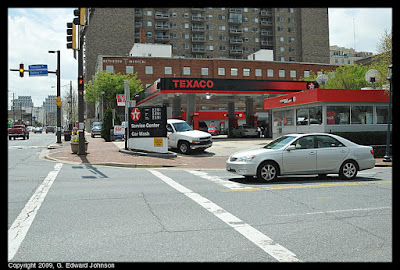 South Street Steaks is now open at 4856 Cordell Ave, Bethesda, MD. They sell "Philly Steaks, Hoagies and Fries" I hear they even put real Cheez Whiz on them if you want. Their grand opening is Saturday, but the store is open now. They also have locations in College Park and Gaithersburg. I'll have to check them out and see how they compare to Philadelphia Mikes. 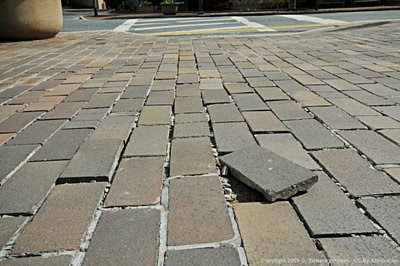 Many areas undergoing re-development want brick sidewalks because they look nicer than concrete. Some people have come out against them because they are harder for disabled people to navigate, the uneven surface makes it harder to walk in high heels, and they are more slippery than concrete when wet. 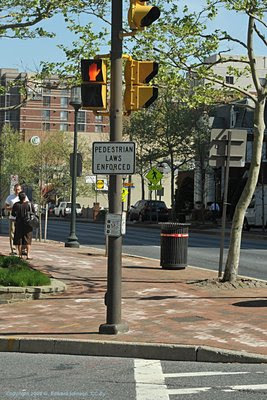 The Silver Spring Penguin reports that the county council decided brick pavers for sidewalks are OK as long as they are done to the "Bethesda streetscape standard", which is "a concrete foundation, a schmear of asphalt on top of that, then an asphalt adhesive to hold the bricks together" Residents swing both ways on the issue. Some argue that the brick surfaces are slippery when wet, while others favor them because they give the place a signature look. I do like the look, but don't think they are very practical. I've previously written about how water puddles up on them and just yesterday almost tripped on a paver that had come up at the intersection of Old Georgetown Rd and Edgemoor Ln, Betheda, MD. I took a picture of the area this morning (see above). Full disclosure: someone had put the loose brick back in place, I pulled it out again for the photo (and put it back when I was done). That whole section needs to be fixed, there are numerous loose bricks and most of the mortar between them is gone. Update 2:20pm. After posting this I emailed Bethesda Urban Partnership about the broken bricks and right now there are people out there fixing them. update 9:40pm. So this wasn't supposed to be a post about these particular bricks, but they are taking out the slim pavers and putting in full size bricks. 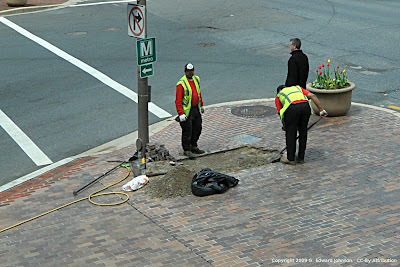 It also looks like they are set in sand, not the concrete/asphalt/adhesive of the "Bethesda streetscape standard". They didn't get done today but the made a lot of progress. 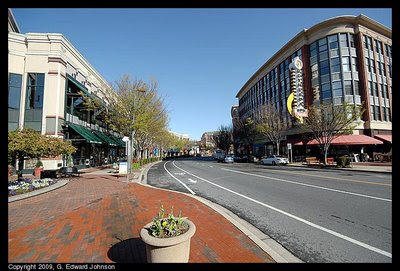 Three Bethesda based companies made Fortune Magazine's annual list of the 500 largest U.S. companies. Lockheed was highest at 54th place. A distant second is Marriott International at number 208. Followed by Coventry Health Care at 226. Bringing up the rear is 449th ranked Host Hotels & Resort. Maryland had a total of seven companies in the Fortune 500. In addition to the Bethesda companies there are Baltimore's Constellation Energy (125), Black & Decker (408) and new to the list this year is another Baltimore company, Legg Mason at number 500. If the Fortune 500 countries were evenly distributed among the states there would be 10 each state, so Maryland did a bit below what you would hope for, but 7 isn't so bad and 4 for Bethesda is really good. 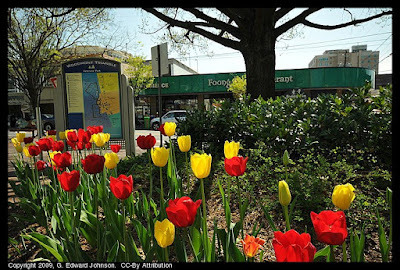 I love spring, it is getting warm and the leaves are just starting to come out on the trees along Woodmont Ave at Bethesda Row. We have made the decision to replace Chevrolet with Nissan, reallocate space within our facilities and work on a plan to renovate most areas... Acura will move to the large building and renovations to the service operation will begin quickly. Nissan will take over the current Acura facility and exclusive Nissan service will be provided in the main service area of the large building. We will continue to employ Chevrolet personnel with top-notch technicians and offer outstanding service and maintenance to anyone that desires it for as long as they wish. 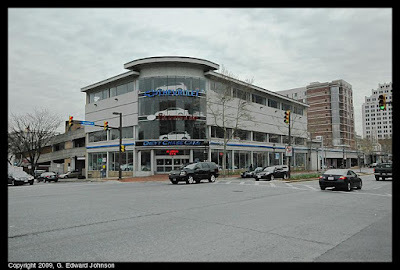 They are located in downtown Bethesda MD at 7725 Wisconsin Avenue. I found out about this from the Washington Post. 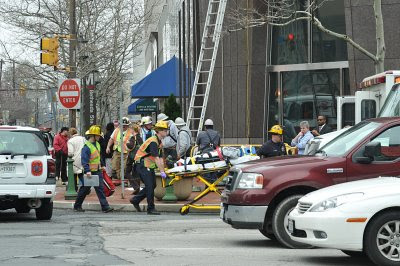 Not something you want to try yourself, but someone was cleaning the outside windows at 7475 Wisconsin Ave, Bethesda MD today and fell two or three stories. This is the building with the red neon "crab" at the top at the corner of MD-355 and East-West Hwy. Emergency workers got there pretty quickly and got him in a ambulance. 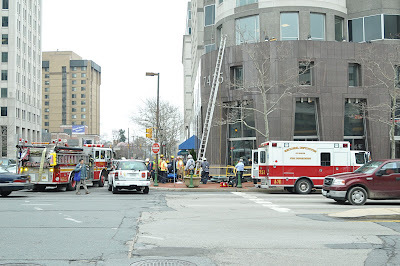 Everything is back to normal now, the other workers are back on the building. 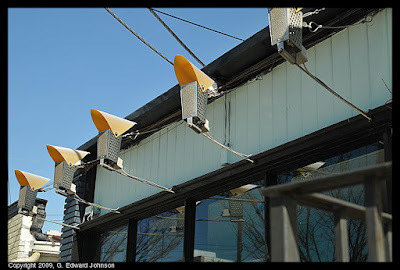 I have been by L'Academie de Cuisine a number of times but never noticed these light fixtures made out of box cheese graters until today. 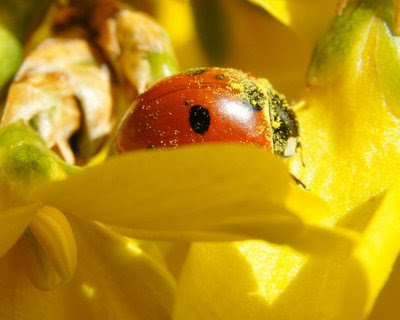 I saw this ladybug on some forsythia flowers yesterday. I don't really think of these as pollinators since they eat aphids, but on purpose or by accident, he had acquired a lot of pollen on his back. You know it is spring when you start seeing insects and forsythia flowers. April 3rd through the 5th is the Sugarloaf Craft Festival at the Montgomery County Fairgrounds in Gaithersburg, MD. Their website has coupons for $1 off admission. They will have jewellery, clothing, paintings, sculptures and a lot more. 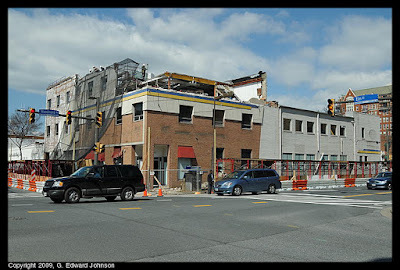 This is getting to be a really popular block for me to blog about, The demolition of the Ritz Camera/Community Auto Repair/Washington Sport and Health building is in full swing. On Monday they were ripping out the inside of the second floor and dumping it out a window. On the Ritz side they were pulling down the third floor by hand, brick by brick. 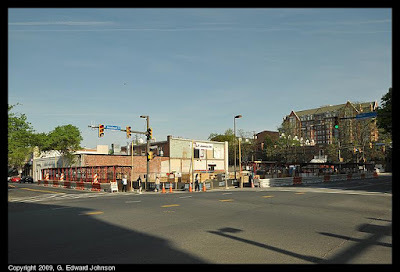 It looks like the demolition and construction will take a while, they have closed one lane of Woodmont Avenue, Hamden Lane, and Elm Street to put up covered walkways (I guess they don't want to bop you on the head with construction debris). As I mentioned earlier, Equinox Fitness will be moving in here with a 4 story 31,000 square foot fitness facility that includes amenities such as a full service spa, a pool, cafe/juice bar and five group exercise studios. I went by here on Monday and took these pictures. Didn't get time to post about it until now. I also saw another post about it elsewhere.